If I had to do it all again I’d be a different Dad. I got better at it as I grew older. I was really making it up as I went along, recalling my own father’s humble attempt at the father role that he too inherited and assumed naturally without much guidance. He did okay. That and good intentions got me pretty far. But being deliberate in surrendered Christian faith would have suited me better. Yes, I went to church and took the family. But I didn’t fully take the mantle of spiritual leadership that I’d grasp wholeheartedly if I had another crack at it. Of course the family is seeing that in me today, particularly my own sons and son-in-law who are improved versions of myself as the next generation should be. Fortunately we are the creation of a loving and patient Good Father who models for us infinite love, grace and mercy that we can ultimately pass on to our own children. With that in mind, I’ve considered the Father/Dad Role this Father’s Day Weekend and humbly submit 5 essentials to be a Great Father. Love God, Then Man – A great and effective father loves the God of the Bible and seeks His favor, not the favor of Man in this world. One may be a good provider, kind and loving, but if he is not aligned with his Creator and does not know Jesus as Savior, then he has made the “big miss” in life and will not be able to lead his family to spiritual Truth. Per Christ’s commandment, loving your fellow man comes after loving God. Love Your Wife, More Than Your Work – A great father loves and cherishes his wife, even more than his work or vocation where he typically receives his glory and approbation. A sign of his true love is to cherish and honor the mother of his children with choices of sacrifice reflecting balanced priorities and Christian values. Love Your Children, More Than Yourself – Children need their father so much and a great father knows this and steps into this responsibility headlong. He puts his children first and relishes his role to not just love them but to raise them in the ways of God. He is unselfish in his commitment to love his offspring beyond his own needs. 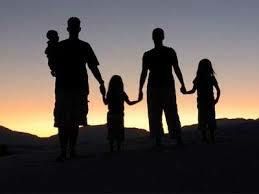 Love Your Family, With a Vision – A great father loves his family as a gift from God and a legacy for the world. He projects an admiration for his family, not just with a view for today, but with a vision of godly impact for generations to come. His family reflects his vision and is a glory and testimony to God. Pray for Your Family, Everyday – A great father knows the source of his greatness and strength: God. He connects with God through deliberate prayer, nothing rote or repetitive, but in heartfelt natural words fully devout and sincere in wholehearted surrender neither random or haphazard. His prayers for his wife, children, and his children’s children are a reflection of his humble submission to and recognized blessings from his own Good Father. Lord, I’m so thankful for the family You have given me. Thank you for (name your wife and each child and grandchild). I surrender all that I have and all that we are to You this day. Bless my family today, for as for me and my house, we will serve the Lord. May each of us experience all the love and favor that You, the Good Father, would shower upon Your children. May we all have eyes to see and hearts to take in what You would have for us today. Give us each the opportunity to fulfill what You desire of us now and throughout our lives. Prepare us in mind, body, soul and spirit to be Your instruments for peace, love and impact in a needy world. Direct us on a path today that You have prepared. Keep us from distractions that would have us straying to the right or to the left, but on a focused path straight and true. Protect us all from physical, emotional, psychological, and spiritual harm from enemies seen and unseen. May we be covered by Your hand so we may continue to grow and prosper as worthy servants of Your Kingdom. Give me strength and wisdom to lead this family in the ways of the Lord today and as long as You would have me in this role on this earth. Thank You, Jesus, for what You have done and what You are doing through my family today and for generations to come. I give You all the praise and honor. Amen. Yes, God is the model as our Good Father. May His Word and Spirit guide us men, young and old, to be good and even great human fathers. Fathers, how are you doing? ‹ America Founded as a City Upon A Hill? Blinded by Idols and Speculations? Thanks for this post – great perspective. Fathers need to take an active role in leading their families in faith. I’ve got a post coming shortly titled, “What I’m Teaching My Kids About Faith,” that has a similar faith-leadership theme…submitting to God’s will and listening for purpose. Very thankful to have read this post and add these faith-fathering tools to my kitbag. If interested, feel free to visit my site at http://www.casteelamericantoughnesssquad.com. Take care Michael! Thanks. I’ve checked out your web site. Good stuff!